As the fashion month comes around the corner from tomorrow New Yorker time, over the last couple of months ahead of the New Year I’ve getting into shape and making sure I look my best. People you may have heard of the hashtag #prgirldiet #nyfw diet? Well it the public viewing of how us fashionista’s maintain ourselves ahead of heading into the tents ahead of fashion week and the surroundings of models and photographers etc. It’s basically your on show every single minute of the time you spend during fashion week. I’m not saying you should follow these (sometimes) ridiculers diets however, you should maintain your health (see my healthy re-invention). I’m not posting to talk about diets... I’m posting regarding a certain beauty brand which has found its way into my beauty box. That product ladies is the Nirvana Spa Beauty Rituals range and it’s easy as 1, 2, and 3. After searching for the perfect moisturizer and cleanses, exfoliators, replenishing masks I’ve finally found my answer to my beauty prays. Firstly the Nspa Beauty Rituals product range starts off with the classic cleanse which is packed with Ginseng and vitamin E, as well as Grapeseed oil and the essential oil Neroli. The cleanser itself is not harsh on your skin even on sensitive skin (which I have). The melting cleansing gel which turns into a cleansing milk when taken off with hot water leaves you skin moisturized after use however, I recommend adding your daily moisturizer afterwards. On the other hand if your skin needs a detox Nspa adds an exfoliator which I recommend twice or once a week to maintain a soft complexion after using step 1the cleanser. Nspa’s brightening detox scrub is a gentle scrub which draws out impurities and leaves your skin smooth after rinsing your face with hot water whilst, providing your skin with the vitamin E.
Since using the entire range of Nspa beauty ritual products I’ve found that my skin is the best I’ve had it in ages whilst, adding my day and moisturizer Boots no7 skincare range. Even my sometimes breakouts have gone due to the fact I’m looking after my skin better between juggling day to day life. The replenishing mask is such a good pick me up just like a cup of tea or coffee. 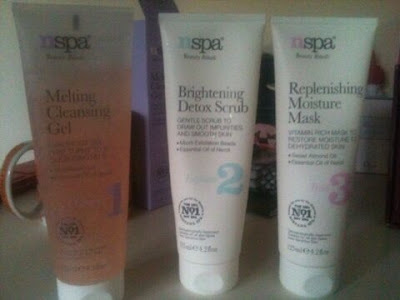 · EJMfashion has not been approached or been given any of these products from Nspa. These products I’ve simply bought throughout my weekly shop whilst, loving the results of the products.